In another time, in another world, spirits are as real to the people of the land as the air they breathe. Though everyone feels differently about spirits, most accept their existence. But spirits are much like people, they have personalities and feelings. They long for companionship, for personal gain, or simply to live. People and spirits have never lived in true harmony, but for the most part, they accept one another as a part of their lives. But just like there can be evil people, there are evil spirits. These evil spirits feed on the worst of humanity. From the simple farmer who is tired at the end of a long day, finds himself possessed without his knowledge and losing his temper, attacking his wife. To a great lord, kind and benevolent, who is killed by a spirit and then impersonated, becoming a terrible dictator and killing hundreds of his own men in pointless conflict. Spirits have power, and when they become evil, that power makes them far more dangerous. This story is set in a fictional fantasy world, based heavily on ancient Japan, with strong elements of magic. There will be everything from samurai, to a hierarchy/caste system. Similar architecture, clothes, etc. But magic exists, through spirits and other means. There are also a lot of creatures from traditional Japanese folklore (though rare), like for example; Oni (ogres), Tengu (bird men), Ryuu (dragons), etc. The plot revolves around a young Kitsune (fox spirit), who though young and inexperienced in much of human society, is wise in the ways of the spirits. However, something terrible has been taken from him - his memories. Most importantly, the memories of his loved one. He knows he loved her, but he doesn't remember who she is, or how he felt, etc. and he is driven by the need to know why these memories were taken from him. He is a swordsman, and his story will begin with simple, individual stories about evil spirits or creatures that he will meet on his travels, while pursuing the thing that took his memories. He will meet up with the other characters of the story, soon in, and have varying encounters with them that will cause them to travel with him and lend their aid to his cause, as well for their own benefits, whatever their reasons. Consider this a dark story, with violence and other such entrapments, but not so dark as to be uncomfortable. I'm looking for between 1-3 other people to join this, maybe more but I doubt it, i'll have to wait and see what people want to play, etc. I've spoken to Kyo, and just a heads up, if he's joining and if he's still wanting to play what he mentioned the other day, he is going to play a disgraced monk. I'll just say you don't have to know a ton about ancient Japan, this is a fantasy story, that though heavily influenced by that culture, it is still a fantasy world. Any information needed will be given, for example, a list of creatures and spirits as a sort of possible bestiary. If you are interested in the story, post your interest here and any character ideas you have to share. In addition, you could talk to me on Skype and we could discuss the RP in detail, and I can answer any questions you have. Here or there, I don't mind. I'm seeing this as a cross between Tsubasa Chronicle and Natsume Yuujinchou (except darker, of course). May I know if the mood will be roughly like that? My preliminary idea is a ninja who saw a kirin as a beacon of hope during some dark days of his (haven't developed this fully) and decided to give up his allegiance in order to travel with them, so that he can see the kirin again. The arrival of the kirin signifies the arrival or passing of a sage or illustrious ruler, and so he wants to know just why it had appeared before him, and whether it was trying to give him a message -- that perhaps he was supposed to aid a sage or ruler to power? Your idea sounds interesting, i'd like to see it developed, it sounds good. I have never watched (to my knowledge, I have bad memory) either of those shows/anime, so I have no idea. In terms of mood, i'd say this is a mixture between like, shows like Samurai Champloo, Samurai X, etc. That level of darkness to them, but still having humour and light-hearted things. Basically consider it a mixture of like action and adventure, alongside slice of life, magical creatures, etc. I am still interested, and still want to be a disgraced monk. Sake and Courtesans for the disgraced monk! Chop! Chop! You're more than welcome to, definitely. Spirits in general fit a running theme, they all interlock in one shape or another, in that sense, they can be closer to one another than humans can (without knowing one another) so, it hurts/saddens them on a personal level when a spirit turns evil. I mean, some spirits have always been evil, but that's something else entirely we'll be exploring in the RP. Thinking of playing as an onmyouji or something like that. You know I'm in on this. Feel free to *cough* include a sage or illustrious ruler in there. For Wstie or Demonic Gate's characters' backstories, since they're not as finalised. So that the kirin actually has a purpose for showing up. Otherwise we'd have to invent a reason for my character to have seen the kirin. Appearance: He has two forms. 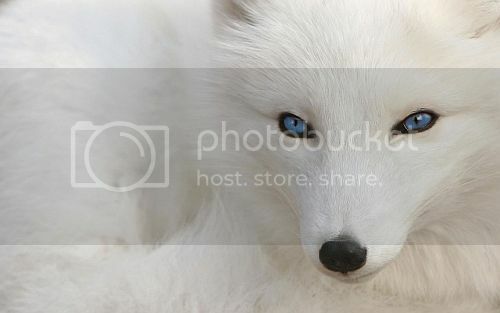 In his Kitsune form, he is no larger than most other foxes, however he is pure white and his eyes are bright blue, with black rings around them. In addition, unlike a fox's usual single tail, he has five. In his human form, he is handsome, pale-skinned, slim and of average height. His hair is scruffy, pure white and aside from a few bangs, is tied back in a thick ponytail that reaches the small of his back. He has the same almond-shaped bright blue eyes and black rings as he does when he's a fox and some would even describe him as 'fox-faced'. He is unable to truly hide his identity as a Kitsune, as some are, and so even in human form he still has fox ears and the five tails that signify what he is. He tends to wear simple, loose-fitting clothes like kimono tops with hakama pants and walks barefoot. He carries a single katana. Personality: Ankou can be fickle, mischievous and has an unusual moral foundation. Though he is not thought of as an evil spirit, he has been known to do things that have been considered a nuisance or even dangerous on occasion. He is a laid-back, pleasant and straight-forward spirit. However, though he is wise, he can also be a little air-headed, and at times, downright forgetful. He can be loyal and loving and values friendship, but being fickle, it can be difficult to gain and keep his trust. Bio: Years ago, Ankou was a simple spirit who lived a life that most spirits would love to have had. He lived in a small fishing village, in a shrine dedicated to him. He was not a particularly powerful or excellent spirit, but being a spirit of luck, he was often prayed to or given offerings in the hope that the fisherman's catch would be bountiful. He enjoyed a great deal of human comforts and eventually, he fell in love with a young woman in the village. She returned his feelings and most everyone in the village were delighted. However, something went horribly wrong, somehow his memories were stolen by a traveller passing through their village. Confused and disoriented, Ankou wandered from his village, forgetting where he had come from, forgetting the face of his love and much of his past. Yet, despite no longer knowing her face, he could still recall how he felt for her, and being separated from her was a terrible pain to bear. So, he bought a sword and began travelling with the intent to track down the man who took his memories. To learn why he took them and find a way to get them back so that he can find his love once more and return to her side. Though the face of the traveller was lost alongside his memories, there is one thing he is able to recall. The man smelt of lotus flowers. Now he travels the lands, looking for the one who stole his happiness, while trying to help those he meets along his way. Though he calls himself 'Ankou' which means 'Angler', in a humorous reference to his time helping the fishermen of his village, his real name he only divulges to humans which he trusts implicitly, because with it they are able to bind, banish or even enslave him. So far, only his true love knows his real name, 'Byakko'. Abilities: Ankou is a capable swordsman and often seems to have luck on his side, but his main magical abilities consist of the ability to shapeshift; either into his fox-form or to mimic the appearance of another person. Also, he is able to use the power of illusion to an extent, so that he can temporarily make things appear, disappear or even change what they appear to be. Though this is limited in nature, if used cleverly, it can be quite powerful. Age: Late 30's in appearance. Personality: Mysterious. Shironagi often seems lazy and unmotivated but holds a lot of wisdom and experience far beyond what his age would suggest. He can be jovial and eccentric at times where he is happy or contented, but also complacent and irritable when he is forced to do something he doesn't want to. His personality seems to have many layers. In times of need he has been shown to possess great power and wisdom, although he is very humble about this, and never exerts himself or abuses his gifts beyond what he deems necessary. He has a habit of getting under people's skin, and often makes a point to shake people's morality and beliefs. Bio: Shironagi's past is shrouded in mystery. It is clear from his mannerism and knowledge that he was once some kind of monk or shaman. However he is quite secretive about his past, and when pressed about it he often spins a yarn in which he changes the details during every retelling, so it is unlikely to be true. Even his name, Shironagi, is not his real name, but a name given to him "by the spirits" as he puts it. Shironagi is a man who has become quite disillusioned with his fellow humans, and often views them as a complex, twisted and cruel species as a whole. He identifies more with spirits who he claims are at least far more "consistent" than humans in their behavior. He tends to travel aimlessly from town to town, frequenting inns and brothels to get his fill of sake and prostitutes. If his nature suggests that he was once a monk, then that time was long ago. For the man he is now would be a disgrace to such a following. In order to make enough coin to get by Shironagi tells stories to groups that he meets, in exchange for either money, food or sake. Or a resting place within a lovely lady's thighs, although that is quite a rare offer. He also, on occasion, helps out with problems with local spirits, however he tries to avoid getting involved if he can help it. He is often subject of gossip, as a renowned story teller people often talk about him with far more grandeur than he deserves. Abilities: Shironagi has a wide range of abilities that are the result of knowledge and prayer. While only a man, his knowledge from his life as a monk has provided him with a great knowledge of spiritual practices. Many of his abilities are the result of time consuming practices and prayer, and are sometimes even limited to certain locations or times of day. There is little he can do "on the spot" in terms of magic. He is skilled in a peculiar martial art that is similar to Drunken Boxing. Okay, that looks great mate. Just waiting on Wstfgl, HH and DG now. Valentine and I are seldom online at the same time, so I'll post a character bio first and we can discuss from there. The basic concept is that Hikaru is a ninja who is actually female, but pretends to be male and pretty much considers herself male anyway. Her actual gender may or may not be disclosed in the roleplay (probably will, because what's the point otherwise, right? ), but for all intents and purposes she will be referred in the male form. Appearance: As a former ninja, Hikaru still favours plain clothes that conceal as much of his identity as possible. His hair is tied in a long straight ponytail, and the lower half of his face is covered by a piece of black cloth. His clothes are also dark-coloured. Most of the time, he favours loose long black or blue robes. His voice is slightly higher when compared to men, and he is prone to squealing in a suspiciously high tone of voice when astounded or alarmed. His gait is confident, but watchful and alert, and he takes small, quick steps, perhaps a nod to his ninja training. His hands are callused but his skin tone is uniformly fair. Personality: There are people born with the nature of a ninja, and there are others who through training and environment develop such a personality, but somehow never manage to do so completely. Hikaru falls into the latter camp. While he respects the ways of the shinobi and their world view, he has not completely assimilated into their philosophy. He tries to be cold and aloof towards people, but is shockingly gullible and has a tendency to believe everything said to him. He is also indecisive and takes a long time to decide and embark on a course of action, a dangerous trait for a ninja. Bio: Hikaru had been sold as a ninja since he was 4 years old. He trained hard, but he was never the most accomplished student, for he lacked the viciousness required to carry out the most emotionally challenging tasks, and was often distracted by other things, such as people talking. However, he was one of the lightest ninjas, and performed well on physical trials. The turning point in his life happened at a time when he was alone. He raised his head and witnessed a kirin soaring through the sky. The image of the legendary creature stayed in his mind in the days that followed, and he found he could not shake it off. It was after a year's deliberation that he decided to stop being a ninja and embark on an impossible quest, to find the kirin again and find out why it had appeared before him. He snuck away from base one night, a light bag of belongings over his shoulder, and never returned since. Abilities: As a well-trained ninja, Hikaru is exceedingly stealthy, able to pass quickly and quietly past a person from a distance of at least 1 metre. At distances below 1 metre, he runs the risk of being spotted, but makes up for it with the ability to climb up any surface, not limited to walls, trees or ceilings. Lastly, he has precise aim. As long as the target can be seen with the naked eye, he is likely to launch a shuriken right on target. Appearance: Seiryuu is tall, lean and dark-haired, and is always dressed finely in the manner of a young nobleman -- he favors long white and red robes. He speaks in a deep baritone, and walks everywhere like he owns the place. He has the pale complexion and unmarked hands of someone who spent most of their life indoors. 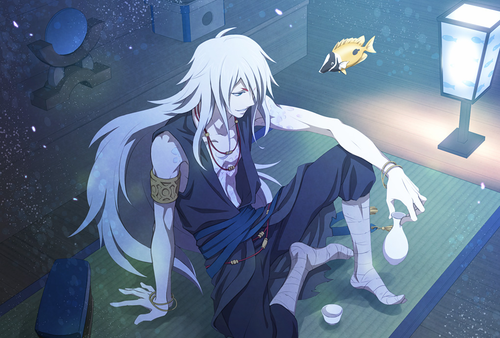 Personality: Seiryuu usually seems calm and composed, but he has a short temper and does not take well to being slighted. He has a burning desire to prove himself to be the best at what he does, and thus, is rather forceful and driven when it comes to matters of dealing with spirits. He sees most spirits as troublemakers who need to be brought down a notch so they respect humans more. Bio: In any other family, Abe no Seiryuu would have been hailed as a prodigy, a genius who brought his family great pride. He excelled in his studies and training, mastering his family's signature techniques and becoming a fully-fledged practitioner at a surprisingly young age. However, he had the misfortune of being a second son in the Abe clan, one of the most renowned and prestigious onmyoji families in Japan. He lived in the shadow of his ancestors and his older brother, who was destined to inherit leadership of the clan by birthright. He felt stifled at home, and decided to wander the world, seeking out knowledge, fortune and glory to prove himself as a worthy onmyoji in the eyes of others. Abilities: As an onmyoji, Seiryuu possesses the ability to break curses, bind or banish spirits and create charms to ward off spirits, but his main power lies in the Shikigami he controls -- Hoshi no Tetsugami, a spirit that takes on the form of a two meter tall masked warrior with skin of steel and the strength of ten men. This powerful spirit has great strength, is near impervious to harm and is surprisingly fast, but cannot stray further than 10 meters from him. I see what ya did there Wst. Taking a page from Abe no Seimei? Edited: Gonna come up with something else. Kinda ended up stepping on Val's character's tail there. Ohhhh, of course. Public domain character ripoffs are the best character ripoffs! We don't have any samurai at all, despite the working title. Maybe you could do something about that, DG. ^ That's both a good point and a great idea, if you are interested. If not, it wouldn't hurt the RP. But just by being samurai, it would create a totally different viewpoint and attitude, possibly from your character but definitely from how others would view you and treat you. Of course, considering that our characters are all wanderers, it's likely that any samurai character would have to be ronin, or there's no good reason to be there. Ronin are somewhat more entertaining anyway. There's avenues for exploring just what happened to their master. Right, after hammering out idea after idea, I have a character. Appearance: A darkly clad samurai impaled by arrows, swords, spears, and other such weapons of war. A link of chains around one of his arms with a sheathed sword in the other. Pale white hair flowing just past his shoulders with a ghostly complexion coming from the skin that is visible of his face. A visor of some sorts covering his eyes in an almost decorative fashion. Personality: A quiet soul, he is often seen walking in the night, solemnly looking at the night sky. When he speaks, he has a very old fashioned style of talking, and a very respectful tone. His voice never coming from his lips, simply echoing emptily within people's heads. Bio: In life, Heiwa was a well respected samurai for a powerful shogun. He fought many battles and lost to no one in duels, but one day he wed and his lord grew jealous of his enchanting bride. To get his way, he ordered Heiwa killed. While he was out on patrol, however, his wife was killed in his bed under the assumption he was within it as well. In his grief, he slaughtered all of the lord's wives and children before slicing off the lord's matrimonial tools, and killing himself in the lord's chambers, his lord's bloodline destroyed and his revenge taken. Upon his death he rose within his own body once more, tied to the fate of the world he now roams the world endlessly, a shinigami to carry the souls of lost warriors to their peaceful afterlife. With each soul retrieved, he must take upon his body the weapon that slew the warrior, thrusting it into his body, his burden to carry for all time. Abilities: Heiwa has an extreme regenerative property within his body, allowing his constant pain infliction to not destroy his body and soul. He is also a powerful warrior who has a mastery over all weapons he touches and possesses, able to make them float protectively around himself or those he chooses, otherwise only able to wield a weapon within his available hands. Unlike most physical spirits, he can see all spirits, allowing him to see even those that are incorporeal. The chains around his right arm allowing him to hold and make ethereal malicious invisible spirits. Alright, great. So, we have an amnesiac Kitsune, a cross-dressing ninja, a drunk ex-monk, a samurai shinigami and a subjugator of spirits. This looks like a cool mix. Okay so, I will likely put this RP up this evening or tomorrow. Does anyone have any questions or anything? Feel free to ask here or over skype as i've got you all added. So we'll just post our own thing till we're supposed to meet up, right? Okay then!